For the first time in forever, to quote another famed Disney property, I feel truly happy. I am happy that after all the hype, after all the excessive media attention it’s been getting from the moment it was first announced onwards, Star Wars: The Force Awakens is finally here. And it is GOOD. Not just good, in fact; it’s GREAT. Really, truly GREAT; like, “this is everything I hoped it would be and so much more” GREAT – but also, at the very least, GOOD. The reason that I am feeling so ecstatically happy with how this film has turned out, is because for a while I HAVEN’T been happy. Prepare yourselves, as I’m about to go into X Factor sob-story mode. 2015 has mostly been an “annus horribilis” for me; for nearly a year, I had been unemployed and thus not earning a regular income, being forced to move out of temporary accommodation and back to my parents’ house to live, which has also led to a diagnosis of depression and being prescribed a series of anti-depressants. Of course, this is absolutely nothing compared to the REAL problems people are facing today, and my white-middle-class-man problems are insignificant next to the woeful plight of war-torn refugees and families of shooting victims; but they are also things that hadn’t led me to having a good year all round. Basically, I’ve been pretty low for a good chunk of the past twelve months. However, what’s kept me going all the way through, aside from the loving support of family and friends (you know who you all are), has been watching and reviewing films for this website, sharing my opinions on the World Wide Web for anyone who’s interested in reading them. I have seen many great films this year, as well as some truly terrible ones, but the one I had been waiting for this whole time was, you guessed it, Star Wars: The Force Awakens. Like most people, I love this franchise and find it to this day to be an excellent example of blockbuster filmmaking spread across multiple films; and knowing that there was going to be a new film was enough reason to get excited. But there was a small part of me that was seriously worried about what would happen if my expectations just weren’t met – most likely nothing because, after all, it’s just a movie; but I was initially worried, especially after the dissatisfaction with the prequel trilogy, that the disappointment could lead to another phase of depression, one that could end up being more harmful than before (that may sound overly-dramatic, but being scorned by the very thing you love would probably drive anyone to think those thoughts). Thankfully, those thoughts need not apply to me anymore. J.J. Abrams has made a Star Wars film that is funny, dramatic, scary, action-heavy, and most of all fun; qualities that Lucas could never quite recapture with any of the prequels, or even – to an extent – the very first one that began it all. Abrams, who wrote the film along with celebrated writers Lawrence Kasdan and Michael Arndt, brings the same bombastic directorial energy from his Star Trek films to this one, and his passion for the franchise shows up everywhere from the kinetic practical sets and creature effects, to the characters both old and new. It’s great to see Harrison Ford, Carrie Fisher, Mark Hamill et al return to these career-making roles, bringing new and exciting things to their on-screen personas that never fail to become uninteresting; but the real revelation, honestly, is with its newer cast. Daisy Ridley and John Boyega, as the two main leads, work great off one another and are individually impressive actors that are able to bring about the same charm and likability that Hamill, Ford etc originally brought; while Adam Driver’s twisted and powerful Kylo Ren is much, MUCH more than just a Darth Vader clone. What I ended up loving the most, however, was the character work. The film is full of moments where the characters are just being their individual selves, not bogged down by pages of exposition and letting their own personalities shine through; these moments make these people instantly more three-dimensional than anything you’d find in the prequels, or even the original film when you really analyse it, and they’re much more relatable and likable because of them. They make you really care about what happens to them later on in the film, which is sorely needed when you’re undertaking a story this refreshingly simple but also not ridiculously so. It’s absolutely wonderful stuff, and Abrams and his hard-working cast and crew really deserve all your support in not only making the strongest Star Wars movie in decades, but also one of the sorely few blockbusters that have actually met and surpassed our expectations (even Mad Max: Fury Road and Inside Out I wasn’t really all that excited for). But most importantly, for me anyway, it has re-established my love for what makes films of this size work in the first place. And that, more than anything, is what makes me unbelievably happy. 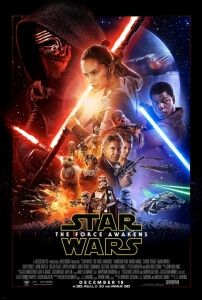 Star Wars: The Force Awakens manages to meet and surpass all expectations, with J.J. Abrams crafting not only one of the strongest films in the saga for decades through a good script and better direction, but also one of the few blockbuster tentpoles in recent years to actually live up to the hype, and then some.